Hating to post and run but with six hours until I have to go to work anything else is pretty much out of the question. Today I'm offering up a photoless layout. Reason being that the LO is about me and since I am usually behind the camera rather than in front of it there are not all that many photos of me that I would be comfortable showing the world, lol. So here we go. 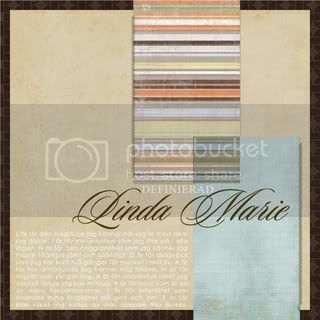 Linda Marie /that's me by the way) defined.